Ceramides are one of the three critical components in our skin. They help keep our skin's protective barrier flexible and healthy. This simple spritz gives your face a powerful boost with 5% phyto ceramide complex that is vegan and paraben free. We also add the protein fibers from comfrey to further aid in night time barrier repair and the restoration healthy skin. Topical application of allantoin stimulates cell growth and repair while simultaneously depressing inflammation making it an ideal companion to our phyto-ceramide complex. Watch us? https://www.youtube.com/watch?v=jRCCFYGUVWg Ceramides can be found in many products, but is often derived from animal fat making it a material that isn't in alignment with Queen Bee's mission of plant derived healing products. This new phyto ceramide complex is a great addition to almost any skin care routine. What are ceramides and how do they work? As we age, our bodies produce less of a lipid (fatty molecule) called ceramide. This results in wrinkled, rough, aged skin. Phytoceramides are the plant-derived equivalent of your body's ceramides. Topical use of phytoceramides does this much quicker than pills. You can see improvement in the skin in three or four days with consistent use. Replenishes Your Natural Ceramide Levels - Restores skin from within - Increases skin hydration - Reduces fine lines and wrinkles - Smooths rough aging skin - Improves the skins structural integrity and "glow" Plant Delivered For Maximum Results. Contains researched dosages of active ingredient ceramides-PCD that delivers Phytoceramides deep into the cells where your body needs it. Cutting edge skin care technology available today that was used in Japan for centuries! 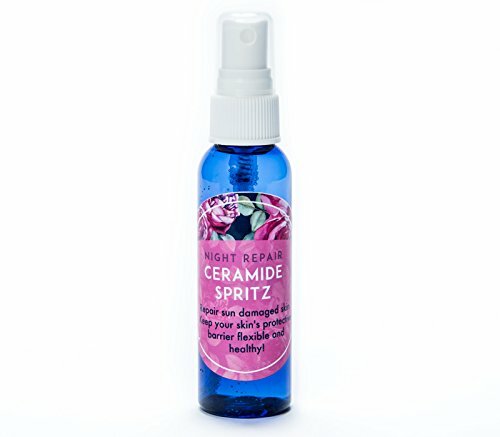 If you have aging, sensitive or sun damaged skin this soothing spritz is just what your skin is waiting for. Go ahead. Give yourself a treat! Spritz. Ceramides help our skin retain elasticity and strength. Our skin is made of three components that bind the skin cells together and ceramides are a key component. This is a simple addition to your skin care routine that you can feel instantly. It soothes redness and repairs while the scent is intoxicating. If you have any questions about this product by Queen Bee Organic Skin Care, contact us by completing and submitting the form below. If you are looking for a specif part number, please include it with your message.